The collection of wooden type mainly dates from the 19th and early 20th centuries, ranging in size from 30pt to 42 line in wood. There are strong holdings of Playbill, plenty of sans serifs in various widths and weights, some quirky faces such as the script Glenmoy and the decorative Victorian. 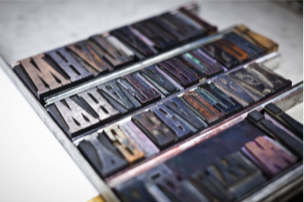 Many different fonts are available ranging from 6pt to 72pt in metal with strong holdings of Bembo, Plantin, Clarendon and Univers, also Columcille. There is also a collection of weird and wonderful metal ‘sorts’ and decorative boarders. Printing presses include: 1833 Columbian Press; a Western flatbed cylinder proofing press manufactured by Adwenst Engineering Ltd, Yorkshire. 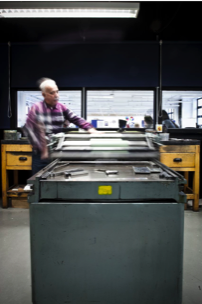 This press was donated by the School of Printing, Bolton Street, Dublin, in the late 1980s; a Swiss Fag flatbed proofing press;a clamshell treddlepress manufactured by Furnival & Co, Express, Redding, London; a desk-top clamshellhand platen manufactured by Hampson Bettridge & Co Ltd, London. This press was donated by Bill Bolger, retired Head of Department; a Mackay Foil press Patent No 3. 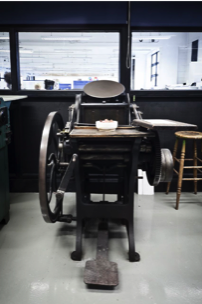 Additionally there is a 24 inch Schimarer hand-operated guilotine; two nipping presses; sowing frames and binding tools and a good quantity of other accessories required for letterpress printing. 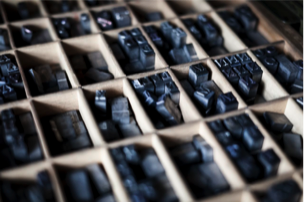 With several operational presses, it has a substantial collection of type in a wide variety of fonts: approximately 280 cases of metal type and 110 cases of wooden type, details of which can be found on this website.